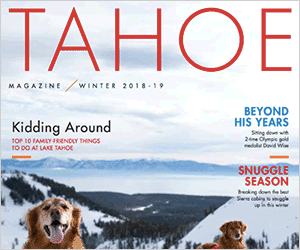 TAHOE/TRUCKEE, Calif. – Content for briefs is selected from e-mail submissions to Community Editor Amy Edgett at aedgett@sierrasun.com. Visit http://www.sierrasun.com to events for the online calendar. Please limit descriptions to 50 words. E-mail for print submissions may be 150-300 words. Items published in the print edition news space permitting.Lake Tahoe Nordic Festival postponedAlpenglow Sports and Tahoe Cross Country announced the inaugural Lake Tahoe Nordic Festival, slated for Dec. 14-16, has been postponed to a later date due to lack of snow. Visit http://www.tahoenordicfestival.com for information.Nevada County furlough dayscoincide with holiday closingsNevada County wants to remind residents County offices will close Monday, Dec. 24 through Tuesday, Jan. 1, in observance of the December holidays and previously announced furlough days.Closures will not impact access to public-safety and other 24-hour operations. The following Departments will be open during designated furlough days: Departments of District Attorney, Sheriff, Probation, Public Works, Registrar of Voters, Clerk-Recorder, and Public Defender. The County encourages residents to plan ahead for needed services and to visit http://www.mynevadacounty.com for on-line services and for additional information on county departments.Nevada County apologizes for any inconvenience closures might cause to citizens who rely on County services. They look forward to serving you on January 2, 2013.Calling all men!Guys Guide to Gift Giving Night Sierra Cosmetic Laser is making it easy for gentlemen to find that perfect gift for their sister, mother, or significant other by hosting a Guys Guide to Gift Giving Night, Dec. 13, 5:30-7:30 p.m. for beer, snacks, and advice on the perfect gift at this free, festive event. With a wide variety of items and treatments available, Sierra Cosmetic Laser staff will make it easy on all the men by assisting them in creating the perfect present. Something for every price range will be available including facials, massages, skin treatments, beauty products, travel size items and gift certificates. The staff of Sierra Cosmetic Laser will make sure each present is fully customized to fit any age. Feel free to name a budget and the staff will help put together a gift package. Women may call ahead and leave a wish list!Sierra Cosmetic Laser is located at 10448 Donner Pass Road in Truckee. Visit sierracosmeticlaser.com, call 530-587-0198 or “Like” Sierra Cosmetic Laser and Spa on Facebook. “Girls Night Out” is second of threedowntown Holiday fun FridaysHistoric downtown Truckee continues December Fridays holiday festivities with “Girls Night Out” Dec. 14, 5-8 p.m. Ladies, grab your girlfriends and create “Wish Lists” at participating businesses, enjoy specials at numerous retailers, refreshments, snacks and treats, special activities, raffles, and more. Confirmed participants for Friday’s event include: Bespoke, Bluestone Jewelers, Cabona’s, Gratitudes Gifts and Home Dcor, Kitsch, La Fleur Rouge, Mo, Jo & Zoe, Mountain Home Center, Nox Fashions, Sipes Tahoe and potentially many more.The holiday fun and festivities will continue Friday, Dec. 21 with “Guys Night Out.”For more information about the TDMA’s Holiday Fridays and a full list of holiday event offerings visit http://www.historictruckee.com/events or http://www.facebook.com/HistoricTruckee.Holiday Book Drive announcedTahoe Truckee Reads, a community based literacy campaign, is hosting a holiday book drive! The focus is on preschool children ages 0-5 years old. It’s never too early to start reading to your child. Research shows kids whose parents frequently talk and read to them know more words by age 2 than children who have not been read to. With every story you read to your child you are building their vocabulary and reading comprehension. Donated books will be distributed to area State Preschool and Head Start programs before the Winter Break so children and their families can enjoy the books together.Donations of new and gently used board books and picture books are being accepted through Dec. 14 at elementary schools, Tahoe Truckee Community Foundation Office, and The Bookshelf bookstore. The Bookshelf is offering a 15 percent discount on preschool books purchased and donated on site.Contact kerry@ttcf.net or Excellence in Education at 530-550-7984.Ice Skating Rink passes for ChristmasGive your family a season pass for the Truckee Ice Rink this Christmas. Cost is $32 for a Truckee-Donner Recreation & Park District child and $40 for a District adult. Skate as much as you like through March 3. Have a Birthday party in the new warming hut for up to 12 children for $25 an hour. Hot chocolate included. Admission and skate rental not included. Call 530-582-7720 for more info.Project MANA announces Stone SoupJoin this season’s Stone Soup, a weekly soup night in Truckee where everyone is invited to celebrate food, live music and community. Soup is prepared and served each Sunday evening from Jan. 6 to March 10, 5-7 p.m. at the Community Arts Center, 10046 Church St. in downtown Truckee. Take your own bowl and spoon and enjoy delicious soup and a good time. Donations are requested but not required.This year Project MANA is spearheading efforts to find different groups of volunteers from the community to get involved in Stone Soup. If you or your organization is interested in preparing soup or volunteering on Sundays, contact Project MANA at 775-298-0008.Noel Nights at Northstar CaliforniaThe Village at Northstar, Thursday, Dec. 13 and 20, 5-8 p.m. Put on your hat and mittens and join Northstar California Noel Nights. The Village at Northstar will be festive winter wonderland with a decorated 35-foot tree, ice skating until 9 p.m., fire pits to warm you, holiday carolers, shopping deals, and much more!Remember to take the little ones because Santa will be here to find out what’s on their Christmas lists and he will be available to have pictures taken. Visit http://www.northstarattahoe.com for information.Give and Take at the Kings Beach LibraryBuilding skills, changing lives: Adult literacy tutors needed. Make a difference in someone’s life. Help adults achieve their goals by strengthening their reading skills. Placer County Adult Literacy Services will provide training to get you off to a solid start, then match you with a learner and provide all the materials you need to be successful. You may be helping your student with reading, writing or GED preparation. Contact Anne Greenwood/Kings Beach Library at 530-546-2021 to sign up!Thursday Dec. 13, 2-3 p.m., bring your computer questions and let Carl Leblanc of Tahoe Tech Group answer them. Carl donates his time and expertise every second Thursday. Don’t miss out on this great opportunity. The fourth Thursday, Dec. 27, 2-3 p.m., Doug Greenwood of Alpensoftware will teach a computer class entitled “Email Basics.” Learn how to send written messages, photographs, music, videos, databases and spreadsheets. Please call to reserve a spot and for library hours at 530-546-2021. Please consider donating new and lightly used books to your public library. Your gift touches many lives! Children’s books especially welcomed. We ask that you drop them by during open hours. Kings Beach Library, 301 Secline St., Kings Beach.Beginning guitar class for adultsThe Tahoe Music Institute is currently registering adult students for a beginning guitar class. The class, taught by Kerry Andras of local band Sneaky Creatures, is focused on learning the basics of playing guitar and covers topics such as tuning, chords, strumming, chord progressions, music theory, singing, folk and campfire songs. Classes meet Wednesday nights from 6:30-7:30 p.m. at the Tahoe Music Institute located at 2810 Lake Forest Road in Tahoe City. Call Shauna at 530-581-0618 or email shauna@tahoemusicinstitute.com for details or to register.Cabin Fever and Truckee Jazz Bandto perform holiday musicThe group will perform holiday music in downtown Truckee weekends and some weekdays about noon-3 p.m. weather permitting, through the New Year. Donations will go toward the Truckee High School Jazz Band.”What the Truckee Airport meansto the local economy” essay contestThe Truckee-Tahoe Chapter of the Experimental Aircraft Association (EAA No. 1073) EAA Chapter 1073 will award three scholarships to individuals who turn in the best essay about “What the Truckee Airport means to the local economy,” 250 words or less. The chapter will award the winning individuals with a scholarship to attend Young Eagles Camp at Oshkosh, Wisc. in the summer of 2013. The award will be made to three different age groups, one for ages 12 or 13, one for ages 14 or 15 and one for 16 through 18. The dates of the camps are June 6-20, June 28 through July 3, and July 23-31. The due date for the turn in of the essays is Feb. 1, 2013. They can be turned in at the Truckee Airport front desk, or mailed to EAA Chapter 1073, 10356 Truckee Airport Road, Truckee, CA, Box 8. Interested individuals should visit http://www.eaa1073.org for additional information about the camps and what the children will learn while in attendance.Truckee Optimist Club Christmas Tree SalesThe Truckee Optimist Club announces 2012 Christmas tree lot/sales through Dec. 23 at the Truckee Crossroads Shopping Center, corner Highway 89 and Deerfield Drive. All profits go directly to youth activities, programs, and scholarships for the youth of Truckee. There will be a very nice selection of locally cut Red Firs (silvertips) as well as Noble and Grand fir trees shipped from the club’s grower in Oregon.Tree sales will conclude on Sunday, Dec. 23 (or once the last tree is sold). Visit http://www.TruckeeOptimist.com for hours of operation or call 530-559-1466.The tree lot is manned by Truckee Optimist Club members, youth from schools and teams that benefit from the proceeds, and by other community volunteers. All profits are included in the Truckee Optimist Club annual budget of nearly $50,000, which goes directly to youth activities (both educational and recreational), major scholarships, and grants for Truckee youths.Volunteer with Disabled SportsDisabled Sports USA Far West is looking for event support volunteers for the 2013 Winter season in the Truckee/Tahoe area. They are gearing up for the upcoming “Ability BASH” fundraiser on April 6 at the Olympic Village Lodge in Squaw Valley. The BASH is a banquet honoring 25 Wounded Warriors disabled in Iraq and Afghanistan who participate in a week-long winter sports camp with Disabled Sports. Disabled Sports is in need of people to help with pre-event preparations and also people to help with event execution on the day and/or night of the BASH.Please contact mary@disabledsports.net and also go to http://www.disabledsports.net to fill out a volunteer profile if you are interested in being an event volunteer for Disabled Sports.Family cross country enrollmentNow enrolling for family cross-country weekend ski programs at the Auburn Ski Club, a community-based nonprofit ski facility next to the Boreal Ski Area on Donner Summit, Interstate 80, Castle Peak exit. A great deal for deal for low-cost, quality family, competitive Nordic programs and groomed ski trails. Saturday family program sessions are offered throughout the season, December through March. Need skis? No problem! Child and adult season rentals available for a nominal fee. Get out and get fit this winter. Visit auburnskiclub.com.